It’s not running ads, creating email nurture programs, growth hacking, or “creating 10X content”. But it is something that if done, and done right, has an enormous impact on every single thing we do as marketers. You’ll create content that your audience loves, bring in more qualified leads for your company, and help your sales team close more deals. 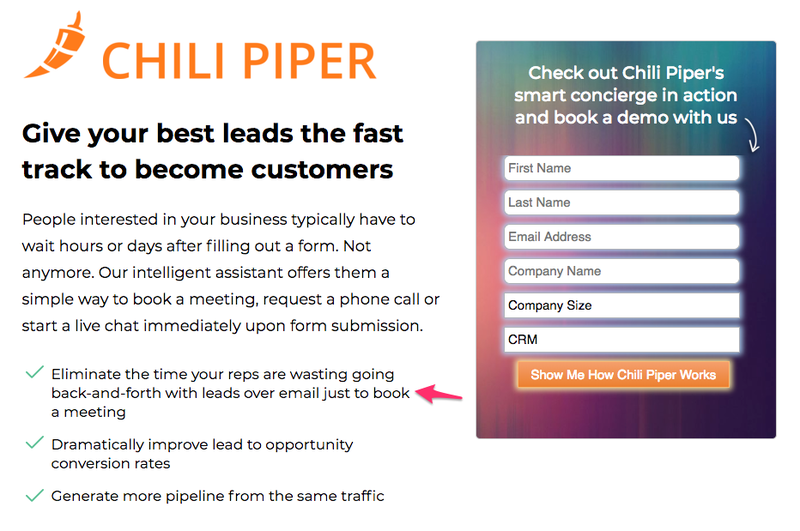 I had just signed an offer letter to become Chili Piper’s Director of Demand Generation. Thinking about all the marketing improvements and initiatives I wanted to get going with had me super excited to hit the ground running. Our company makes software that helps B2B marketers and sales people improve the buying process for their prospects. Plus I could just talk to our customer success team and a couple of our AEs to figure out exactly who we need to get in front of. They talk to our prospects and customers all the time. But when talking to my good friend Kevin Dorsey (who is Head of Sales Development and Enablement at ServiceTitan and a super smart dude) about my plans for the new gig, the first thing he asked me was if I was going to be interviewing any customers. Sigh… he was right (oh wise sales master). I’ve done customer interviews in the past and know exactly how valuable they are. At my previous company, it was crucial in helping my team and I grow our organic traffic from basically nothing to 275,000 visitors a month, and help the business grow from 100 to over 4,000 monthly members. I just figured I’d wait until I got the ball rolling on some other things first. As marketers, we’re constantly drawn to the quick wins – the “dead-simple tactic” or “secret hack” that deliver short-term results without a long-term and sustainable strategy. But how could I do any of our marketing if I don’t *really* know our customers and why (in their own words) they find our product useful? 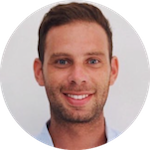 Benji Hyam from Grow and Convert puts it perfectly in this post about user research. So before I launched any ads, wrote any blog posts (this is the first one by the way), or improved any of the copy on our website, I got to work on chatting with our customers. 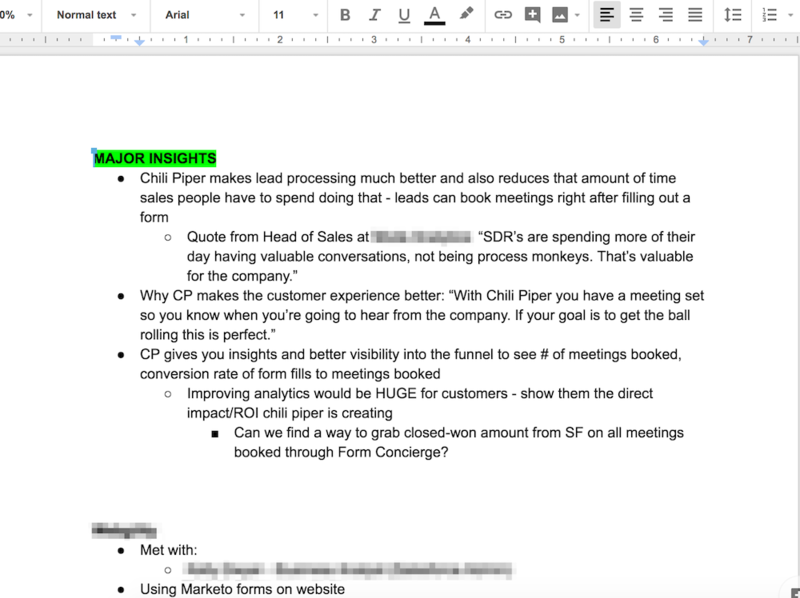 Here’s my entire process for collecting customer interviews and how I’m using the insights from those interviews to improve our marketing. Most importantly, I hope this will inspire you to go interview some of your customers whether you just started at a new company or have been putting it off for a long time. I get it – it’s not practical to do a ton of in-person interviews (unless you have lots of miles on the company card), but if you have customers in concentrated areas, I would recommend you go do at least 2-3. Your second best option is video call, preferably over zoom or skype so your customer can share their screen when necessary. If phone or email are your only options, those are still good too. I always like to have my coworkers who interact with our customers the most make the intro to ask for an interview. You’ll typically get more responses and people willing to do it that way. Gaines mentions that I’ll bring them some food – I hate coming empty handed, so I wanted to make it worth their time a little bit to meet with me. None of our customers took me up on the food offer, so I just brought them some cookies instead. Who doesn’t like cookies?? If you’ve read this far, you’re probably wondering what questions I decided to ask our customers. What sites/blogs do you read for professional development? How did you find out about [your product/service]? What were you doing before you started using [your product/service]? Why did you guys decide to start using [your product/service]? Who on your team was involved in the evaluation and buying process? How does [your product/service] fit into your day? What does [your product/service] let you do that you couldn’t do without it? What are some of the results you’ve seen since implementing [your product/service]? How has Chili Piper personally helped you achieve your goals? What’s it been like working with the [your company] team? Why would you recommend [your company] to other [people you serve – i.e. data analysts]? I can’t stress this enough: Use these questions as starting points, don’t just go through your list of questions one by one. A lot of the best insights you’ll get during interviews are in the follow-up questions that you didn’t prepare. Just be curious and let the conversation flow naturally. It’s not listed in the interview questions above, but you should absolutely watch them use your product. You’ll find that each customer has a unique way of using your product. It can be a little awkward at first, especially if you’re new at the company and you don’t know the product inside and out. These “interviews” are really just open-ended conversations and your customers will likely have some questions that you might now know the answer to. It’s ok to say “I don’t know, but I can find out.” Just make sure to write those questions down, get answers, and follow-up with your customers. The other thing I highly recommend is recording your interview instead of taking notes the entire time. That way you’re having more of a conversation than a note taking session. With your customers permission, pull up the recording app on your phone, press start, and set it on the table for the duration of your conversation. Then you can use a transcription service like Rev (which I’ve used in the past a ton for customer interviews) to transcribe all the audio into text. I’ve found it much faster to read through text to pull out insights versus listening to the audio, but to each their own. BONUS: I’d also recommend watching or listening to as many sales calls/demos as you possibly can. Walked through a lot of the different functionalities of your product/service. You won’t get the same insights as customer interviews, but you’ll learn a lot about early objections your prospects have (which are AWESOME to incorporate into your marketing copy) and what exactly piques their interest about your product/service. You also get to learn about the different stakeholders who are involved with making the buying decision. So you’ve done your interviews. Now what? The first thing you should do is take those transcriptions and write out all the good details and insights that you possibly can. At the top, I compiled all the best insights into one area. Then I have notes from each customer meeting separated out below that. The exact words that your customers use make the best copy. So I took what our customers said (as close to verbatim as possible) and incorporated it into landing pages. For example, one thing I head over and over again from our customers is how much they loved that it eliminated the wasted time their sales reps we’re wasting going back and forth via email with leads just to schedule a demo or meeting. I learned that a lot of the people who are actually responsible for implementing our software and managing it are marketing automation and sales operations folks. With that in mind, I’m incorporating those people into our content strategy so we create useful posts and guides for them (called Customer Content Fit, which I learned about from the guys over at Grow & Convert). Everyone in your company is a marketer, whether they realize it or not. We all work on things that face our customers and that our customers use. Post it in the company slack channel, email it to the company listserv, whatever. Just make sure these highly valuable notes don’t sit in your silo. There’s gold in these notes and they will without a doubt help each person in your company better understand and serve your customer. If you talk to customers who absolutely love your product, you should definitely ask them if they’d be interested in doing a testimonial. Video is ideal, but written is great too. The worst thing that happens is they say no (or their legal department says no). Always worth asking though in my opinion! One final thought – interviewing and talking to your customers should be an ongoing part of your marketing strategy. Your product will change and serve different needs over time. Like all learning, getting insights from your customers is never a one-and-done thing. 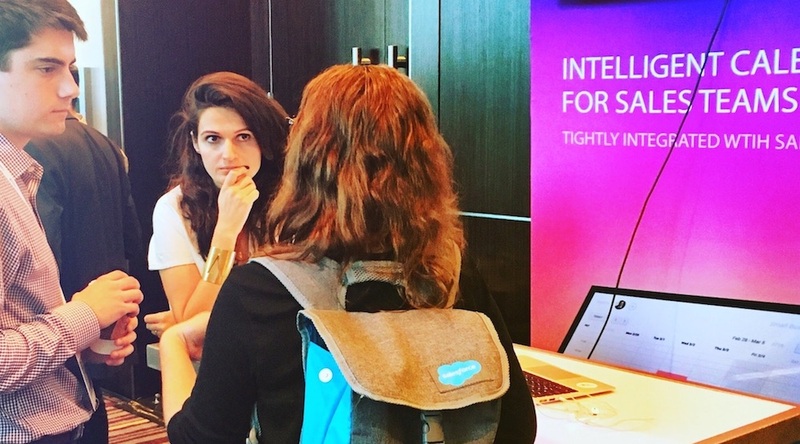 So go, fellow B2B marketer – make time to meet with your customers! Learn about their problems, find out why they even bought your product in the first place, and use those insights to help your company grow. A huge Thank You to all of our awesome customers who let me drop by their office or spoke with me over video! I know your time is extremely valuable and I appreciate that you were willing to spend it with me to learn more about you and how our tool helps you.